Following on from my last butterfly post from Kefalonia. 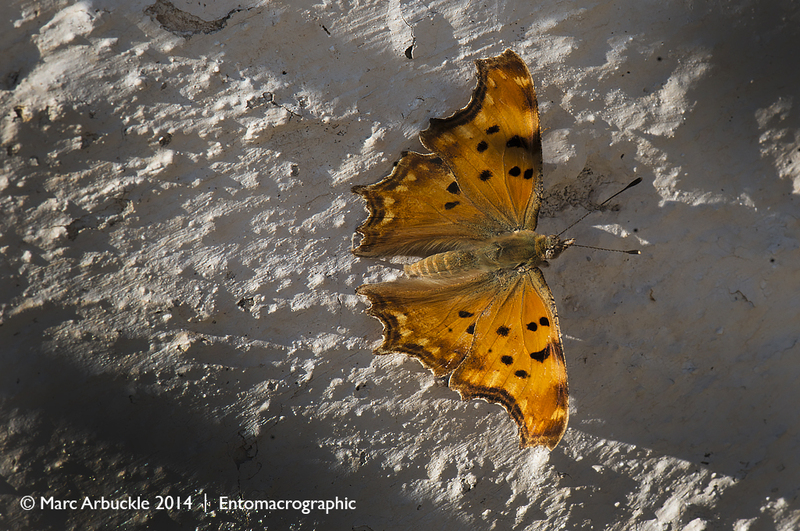 Walking through the village of Assos a new butterfly species introduced itself to me, the Southern Comma Polygonia egea. A paler, less heavily marked (but perhaps slightly brighter orange) version of our native Comma Polygonia c-album. For a comparison see my previous posts a female comma and spiced orange. Well it certainly liked the heat, happily basking in the full afternoon sun. Usually on the tarmac or on the whitewashed walls, like the one pictured here, caught between the shadows. I noticed that the underside was slightly paler and less cryptically marked than our indigenous species and the characteristic white marking on the underwing was more silvery and less like a comma and more like a squashed letter ‘Y’.